» Holy Faux Awesomesauce, Batman! First choose your design. There are patterns out there you can buy or download for free (designed to be scaled up or down based on your project size). 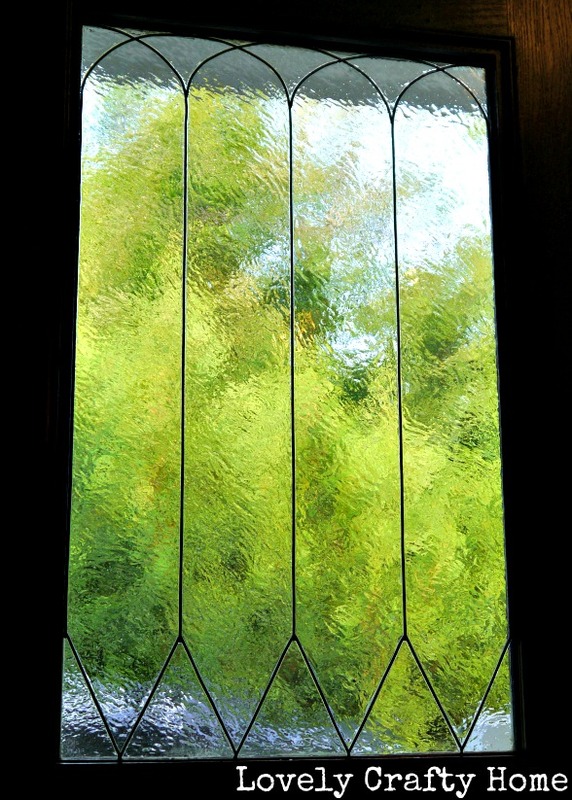 I basically looked through thousands of images to find classic examples of leaded glass and then made up my own. Here is my super awesome sketch. 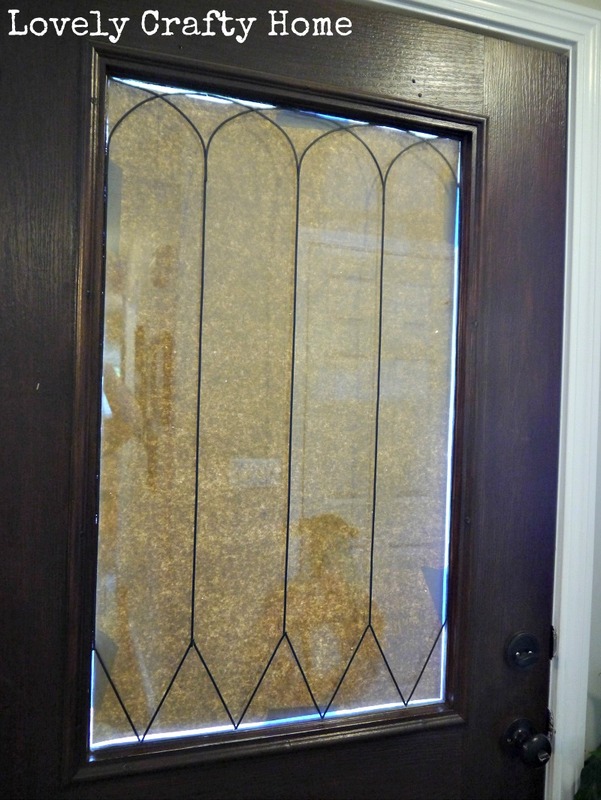 I measured the height and width of the window (35″ x 21″), and came up with the spacing solely based on trial and error. I thought 5 “sections” would make each one too skinny and 3 would be too fat. Four ended up being perfect because it gave an easy to measure number of 5.25″ wide (21/4). 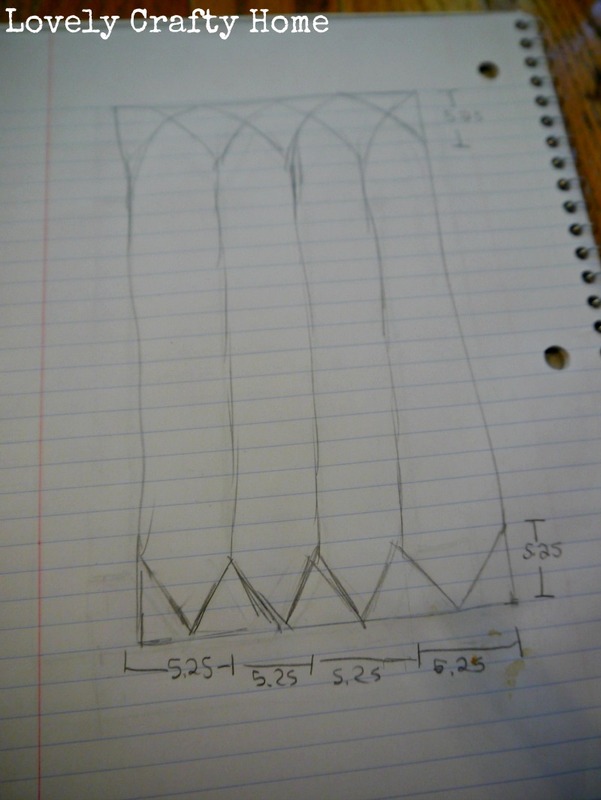 I decided for ease of calculation that 5.25″ would also be the height of the triangles and the arches at the top. 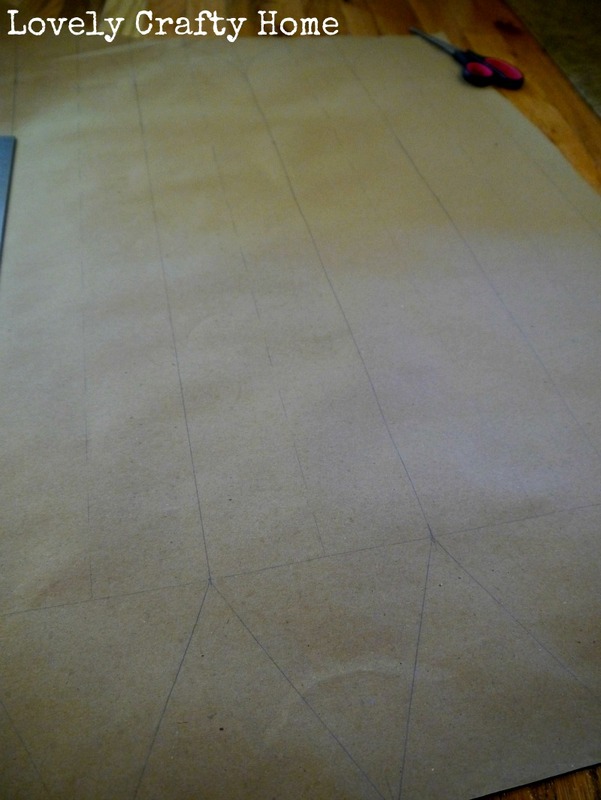 Using brown paper, I cut a piece to the size of my window and began drawing my pattern. 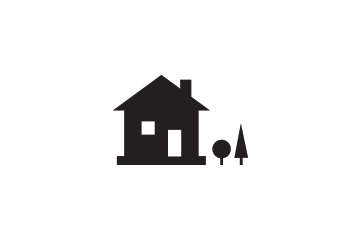 I’ll spare you the details since my design is so specific to me and my space. Essentially it involved drawing lots of lines 5.25″ apart then splitting those sections in half to make triangles and arches (I traced a dinner plate for the arc). It’s really hard to see on this picture, but maybe if you squint you can see my pencil drawing. 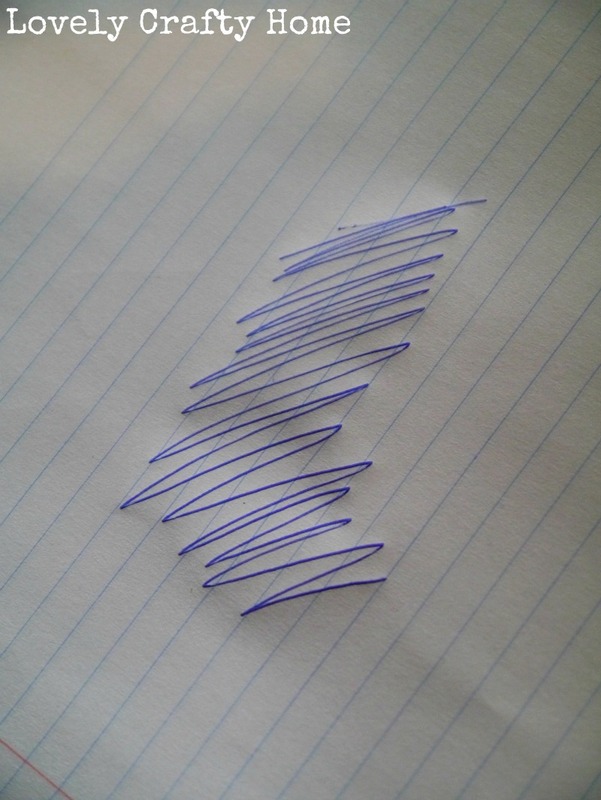 Engineers are afraid to use pens (but I suggest you do use one, because it will be easier to see). So, now that you’ve got your template, tape it to the back of your glass (facing so you can see the lines through the glass, we’re painting on the inside). Here is where the process broke down a little for me. 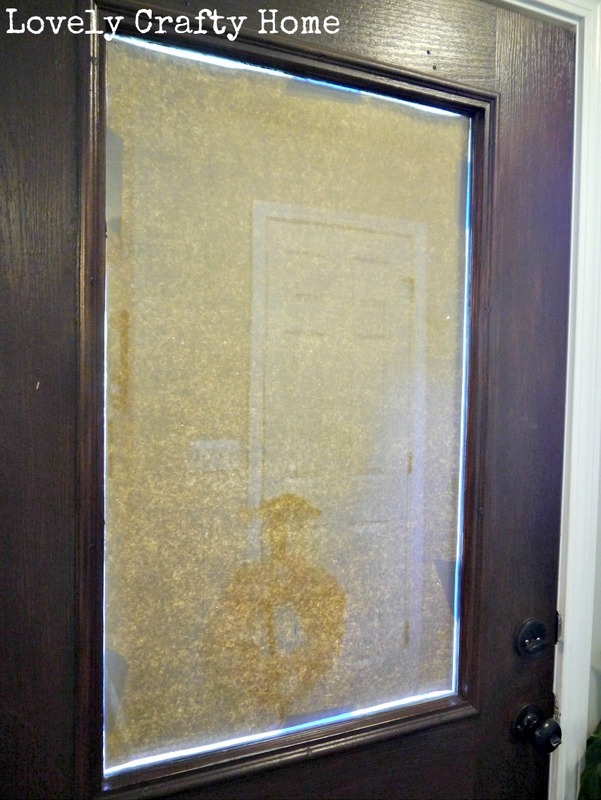 The glass on our door is double paned, and the air gap in between was large enough to where it was actually difficult to line up my lead strips on the drawing. It’s different than working with a piece of glass from a frame laying flat on a table. It suffices to say that I ended up using the drawing as more of a guideline. However, I’m still glad I made the drawing, and the difficulty probably just had to do with my specific door. But it’s something to keep in mind if you are wanting to do a complex design…those may be better for projects you can work on laying flat. 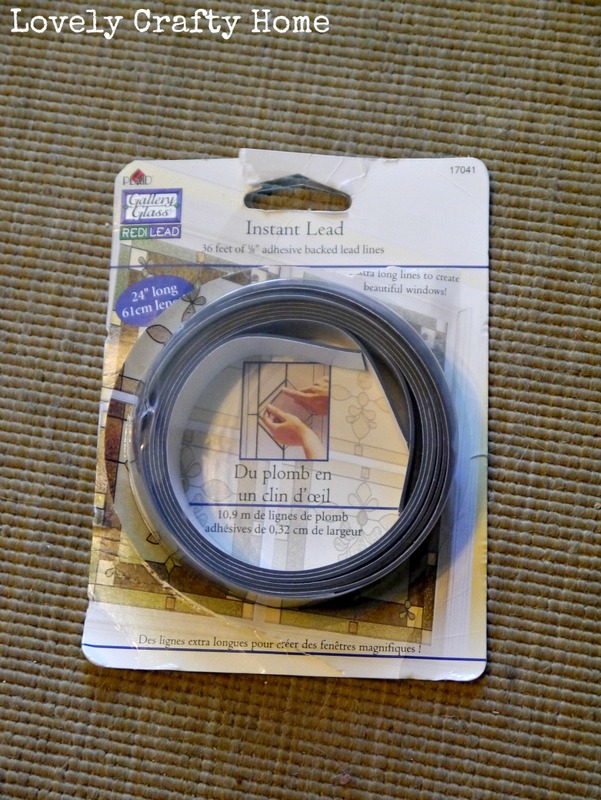 Laying the Redi-Lead is really easy, it curves nicely and re-positions easily. I think the look is realistic, much more so than the older method of using the black liquid leading to draw the lines (many people still do this for smaller projects). Plus, when you’re working on a vertical surface, liquid lead is not recommend. For those reasons, I highly recommend using Redi-Lead if you can find it. Once you have everything the way you like it, trim all the joints and dot with liquid lead (you just need the tiniest bit). Allow to dry for about an hour or two. 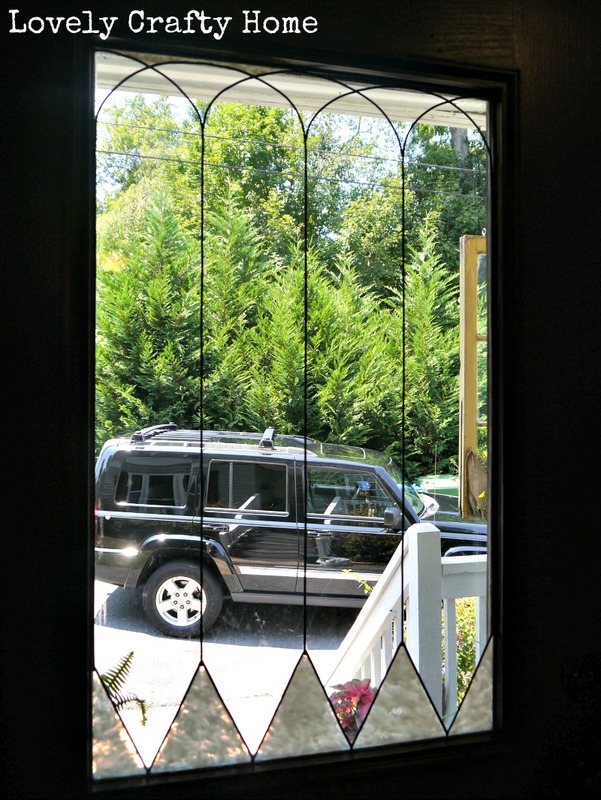 Sorry in advance for the gratuitous Jeep shots…this door is notoriously difficult to photograph from any angle. Now it’s time to start in with your colors (or clear, in my case). For vertical surfaces, the preferred method of application is to start at the top of a segment and “comb” as you move down (I’ll explain this more in a minute). Almost everything I read was VERY clear that the bottles of paint should not be shaken. Also, the tip of the bottle already has a hole so don’t cut it with scissors. Ready to paint? I watched a few videos and looked at a few other bloggers to learn the technique of applying the paint. 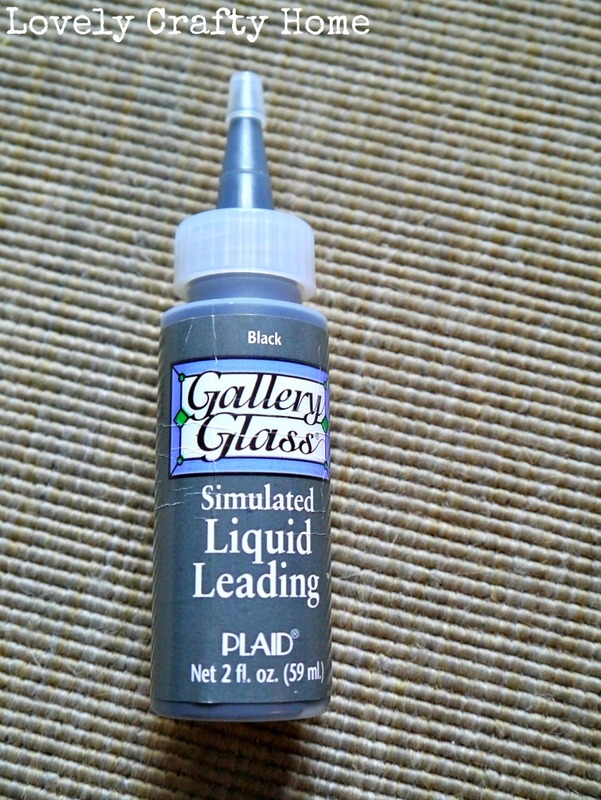 I’m not an expert on this or anything- having been at it for approximately 5 hours- so if you are looking to do something more colorful/detailed/complicated you might want to check out the Gallery Glass website and blog for some tips. Do small area’s at a time (1-2″) because the paint sets up pretty quickly. Eliminate any large bubbles with the toothpick, but I encouraged the teeny tiny bubbles for a more vintage-y glass look. The zig-zag combing of the toothpick smooths the paint and creates a nice wavy texture when dry. There are a lot of different methods of paint application though depending on the look you want. The Crystal Clear paint goes on white and dries clear (and I’m pretty sure the colors look a lot different when wet as well, so do a test if you want to be sure of the finished look). I thought I would start with the small sections and let them dry to make sure I liked the technique and was pleasantly surprised that they started to clear up fairly quickly- quickly enough for me to tell this was going to be epically awesome. So on and on I went. I let the window dry overnight and snapped these pictures this morning just because I am so excited to show you the final result. But something like this might end up looking really fake, even though it’s neat. What’s the verdict? I love Gallery Glass. Unfortunately, I think its is probably stuck in the 80s which is why it’s hard to find examples of nice, simple enhancements anyone could do in their home. The process was simple and easy to do for a first-timer. Supplies are fairly cheap for something that ends up looking pretty high end. I’m even tempted to experiment with color now! There are some drawbacks- it’s designed for indoor use only (however I may test this theory with the clear and some kind of spray sealer). Apparently long periods of direct sun may fade colors and high humidity may cause it to kinda melt or detach over time. So it probably depends a lot on where you live. I wouldn’t let it stop you from experimenting, though. Even on a bathroom window! Thanks for testing it out. 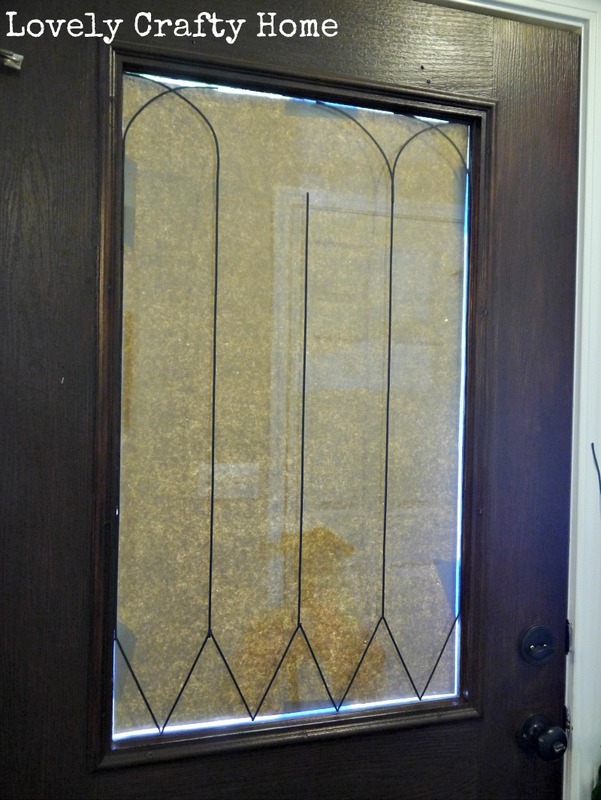 I think I might try this on my powder room window! Looks fabulous!!! 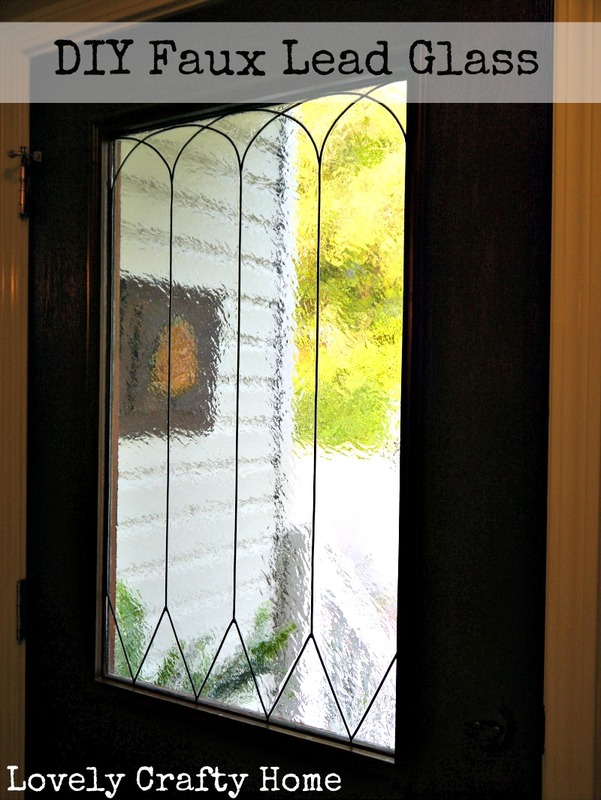 I wish my front door had glass so I could do this to it! Wow, this looks fantastic, and really makes me wish that I hadn’t used the frost spray on my window!!! I may remove it and try this instead! My only hesitation with the glass paint are the warnings… “don’t use if you like have reproductive organs that work” or something to that effect! lol! Did this brand have scary warnings? Julie- I just looked at the bottle and there are no warnings, even the simulated lead says it’s water based and contains no lead (I figured it didn’t have any lead, but it’s nice to know it’s water based. I would think that a serious warning would be on the actual bottles, right? Versus reading it on a website or something? Maybe it’s because this kind isn’t being baked or anything to set, like if you were wanting to paint a glass or a mug. This looks amazing. I wish I had glass too! That turned out so neat!!! Looks like the real thing! 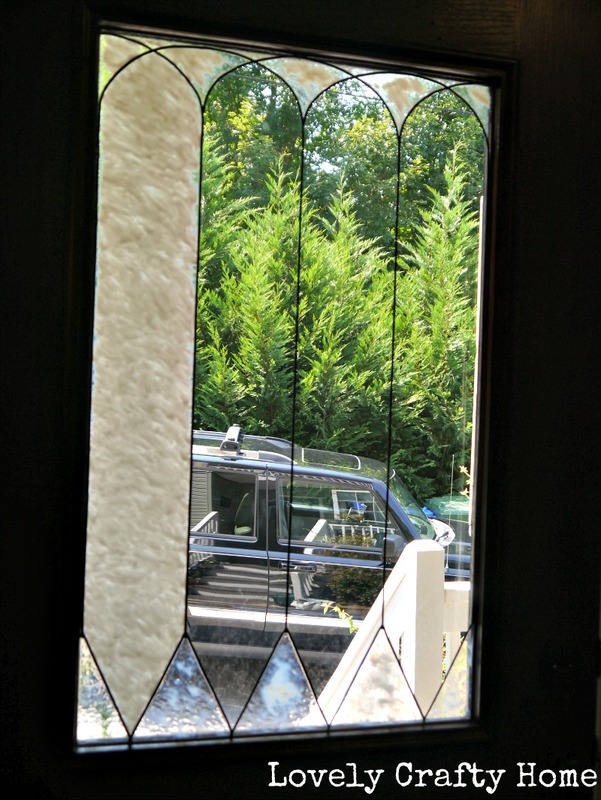 I can’t believe that it was so easy to make your window look so great! I wish I had a window to do this to! This is awesome. Thank you for the tutorial. I am considering something like this on builder grade mirrored closets. It may be a crazy idea. Thanks for the inspiration! This looks awesome! But what does it look like from the other side of the glass? I am wanting to do this technique for my front. 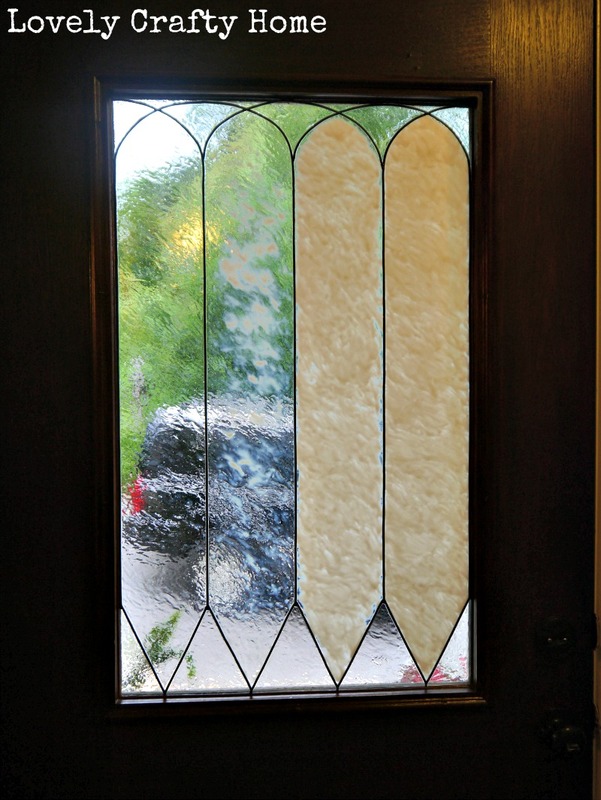 The door is solid wood but the sides a panel above door is glass. I am wondering how it looks from the opposite side. 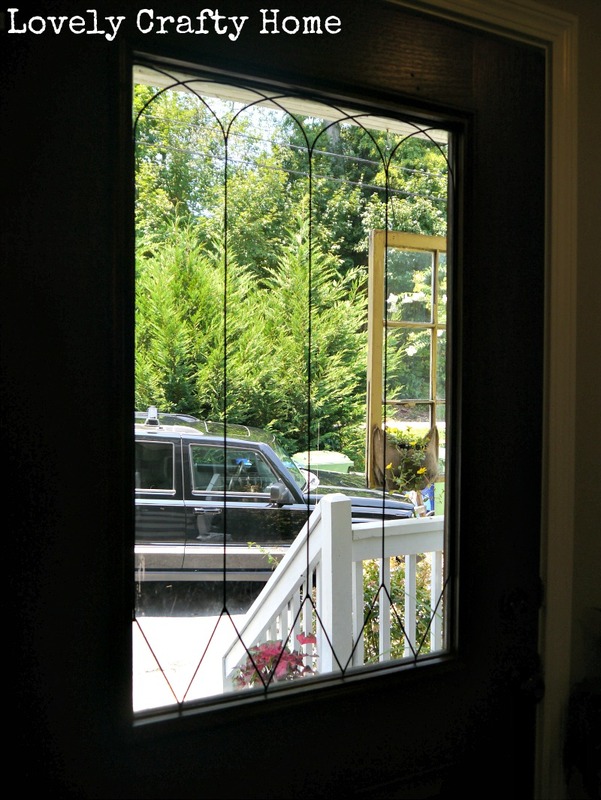 Would you want those coming in the door to see the texture look or as you are exiting the door. Does it look just as nice for the reverse side or would it be a good idea to actually do both sides of the window pane? Know this is an old post but hope you are still getting comments from it. Your door is just wonderful! Hi Mary, technically this product is for indoor use only. I think it looks nice on the outside, just not as obvious. I have thought about doing both sides, but I don’t know if it would hold up well. would this work on a shower door even with all the water and the humidity? Any special treatment? I love this tutorial! I’m going to try this on my own door this evening. This post is old and I’m hoping you will respond. 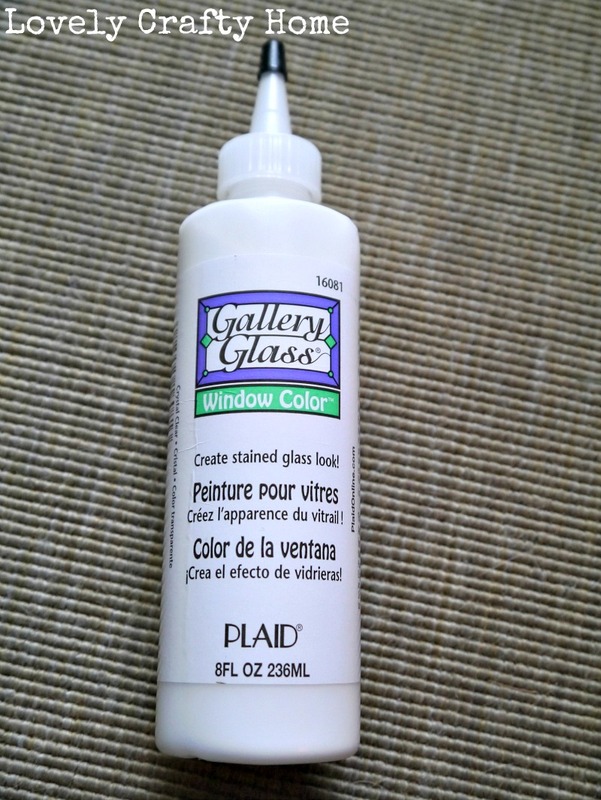 What color did you use for the Gallery Glass color? They have snow white, clear frost and hologram shimmer. I love how yours turned out and would love love Love TO KNOW the color YOU used! Also Do you have to cut tiny strips or are those pre-cut already? It looks like its really wide. Thanks in advance. 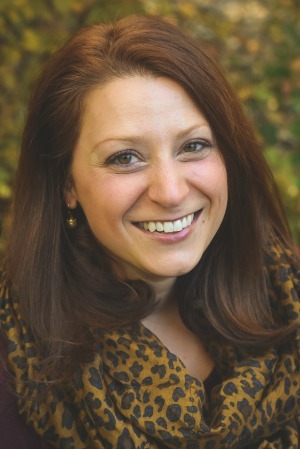 Hi Christie! The color I used is called “crystal clear” but they may have changed the name in the past few years. The strips are 1/8″ wide and you can just cut them with scissors. I used the black “liquid leading” for the joints to simulate a real weld. Good luck! Thanks so much for the fast reply! Super excited to say that they have that color! I almost missed seeing that one!  I love your blog and just subscribed. You are so talented and entertaining! I’ve been on your blog all morning! haha. Thanks again! Aw thanks you are too sweet! I hope you are inspired! 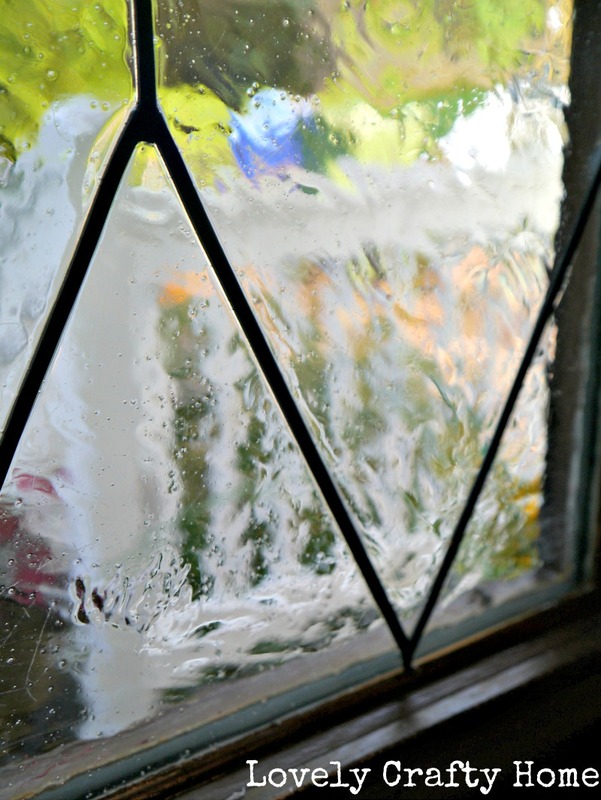 Can you clean the inside of your window with windex? Did you sponge it in first before using the toothpicks or paint it on? It looks great! I just squeezed it on right from the bottle!